Dems in Philly: No clue? USA allergy? Listening to the Democrat delegates in Philadelphia chant "Not a clue," in response to Joe Biden's charge that Donald Trump doesn't have a clue as to what motivates and animates the middle class, does prompt a certain amount of sympathy for the soon-to-be-exiting vice president. Don't laugh. This is a matter worthy of great compassion for the VP. You have to remember: for all we know, he may still be taking lessons on how one counts to four. Embarrassing? Not at all. The mainstream media doesn't "rub it in" that he has said that J-O-B-S is a "three-letter word." Please, be kind to Mr. Biden. He needs "a clue." From the "clue" to the "allergy"
In a previous campaign, Barack Obama gave vent behind closed doors to some moneyed San Francisco "insiders" that his political fortunes were marred by the ignorance of those vulgar (apparently to him) common people to whom his party in the past has paid tributes worthy of royalty. 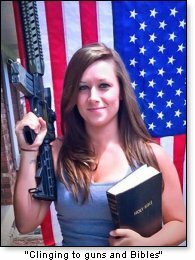 The problem, according to Mr. Obama, is those "bitter" voters who "cling" to their guns and their Bibles. When the quote became public, there were some shocked gulps followed by a change of subject, a vigorously-attempted silence helped along by the more servile elements of the media. Great progress? To what end? Throughout his presidency, Barack Obama's promised "transformation of America" has taken on a meaning that was missed by many when it was promised. His subsequent performance in office indicated he meant to tear America away from its cultural moorings. To a huge extent, he has made great progress, much to the chagrin of millions who shudder when Hillary Clinton promises to extend and expand what Obama has started. After 8 years, the Democrat Party of today is no longer your father's, or even your older brother's or sister's, Democrat Party. Now the mask has been ripped to shreds. For during this convention, House Democrat leader Nancy Pelosi felt perfectly comfortable saying before a live microphone what many have suspected were her party's real directions for years. When asked why it is that so many white males (once the backbone of the Democrat Party) have been voting Republican, including for Donald Trump, the former House Speaker responded that "non college-educated" white males were "voting against their own economic interest" because of guns, God, and gays. The three g's." Now at last, that roar of approval (right out in public) you hear is coming from those who still long for more "progress" toward an America unknown to many of us. Our America was built by our forebears and by millions of legal immigrants in the decades that followed. Nancy Pelosi seems to resent that real America. No doubt that is why she and other Democrats encourage the ongoing invasion by illegal aliens, so they can build an America in the mindset of Howard Zinn. Pelosi also faulted the voters who don't agree with her for not backing "a woman's right to choose." Why do they – over and over again – stop in the middle of a sentence? To "choose" what? Why are they so ashamed to say the word "abortion" out loud? One woman in fact did say the word out loud and she brought the house down from the cheering crowd. Is it not interesting that Democrats are routinely vague as to what they're talking about? There must be a reason. Pelosi's credibility was damaged, however, the day she said lawmakers needed to pass legislation "so we will know what's in it." Perhaps, like Biden, the former speaker is in search of "a clue." President Obama's Wednesday night convention speech, of course, let us know – in case we had forgotten – what a great president he has been and how he is taking us down to the kind of America he believes we should have. 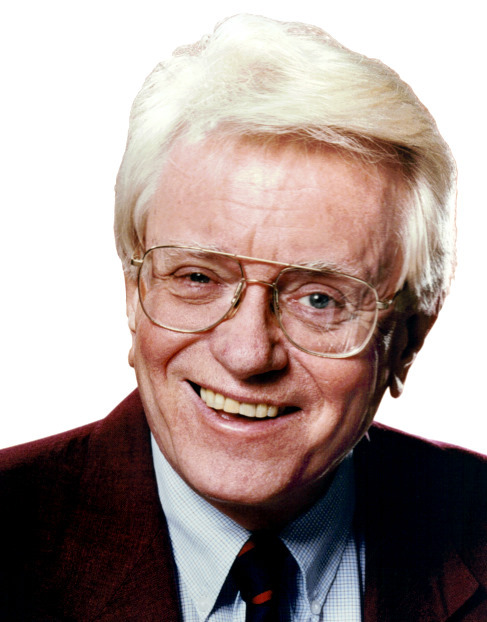 Though he did not spell it out, that kind of America is the one envisioned by the likes of "Democratic socialist" Bernie Sanders who – of all the scores of vacation spots worldwide – chose the old Soviet Union, our Cold War enemy, for his honeymoon. The president's speech to his fellow Democrats painted a picture of a presidency that was the exact opposite of what he has given us. He spoke of how we should "do all you can to help each other," rather than "demonize" those with which we disagree. That study of arguably skilled insincerity omitted such events as when he intoned that those who disagree with his environmental policies want dirty air and want dirty water. No demonizing there, right? Also not included was the president's invitation to Representative Paul Ryan (then Chairman of House Ways and Means) to attend a presidential speech. He even arranged for a front row seat for the congressman. That vantage point and event were used by the president to give the Wisconsin lawmaker a public tongue-lashing because of his views on tax policy and growth. But, hey! Cheer up. There were comic moments in Philadelphia. Take for example, a Bernie Sanders supporter who, in the process of trying to burn the American flag, managed to set his pants on fire. 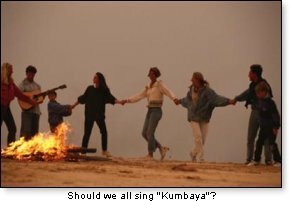 All the sweetness and light this week: Should we all sing "Kumbaya"?